As former prosecutors who have been defending charges in Monmouth County for decades, we are certainly highly familiar with what is involved in defending a Middletown DWI charge. Our team of defense lawyers have represented hundreds of clients arrested for DUI along the approximately 350 miles of roadway within the township. We have an exceptional level of training and experience in this area of law including several lawyers who are among the small group in the state that are dual certified on both the Alcotest breath test device and as instructors in Standardized Field Sobriety Testing. Our lead driving while intoxicated attorney, Colin Bonus, Esq., handles nothing but N.J.S.A. 39:4-50 cases. To speak to a lawyer in our Middletown Office, contact our firm online or call us at 732-615-0039. Your initial consultation is free of charge. With the largest police department in Monmouth County, there’s no shortage of police officers patrolling high traffic roads in the township like Route 35, Route 36, County Route 520 (a.k.a. Newman Springs Road), Leonardville Road and Navesink River Road. The Garden State Parkway also runs through the municipality and all driving while intoxicated summonses issued between Exist 109 and Exit 114 also result in DWI offenses in Middletown. The combination of so much roadway, two law enforcement agencies, and the highest population in the county (i.e. approximately 66,522 residents), results in the town handling more than 200 DUI violations most years. 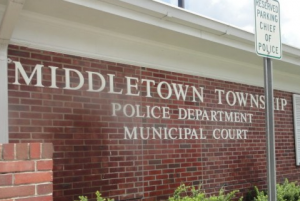 All of these charges are heard in the Middletown Municipal Court located at 1 Kings Highway, Middletown, NJ 07748. The Court and its administrator, Patricia McNamee, can be reached between 8AM and 4PM at 732-615-2036. Honorable Michael D. Pugliese serves as the judge. He is responsible for deciding all issues of law and fact as there are no jury trials in municipal court. A DWI is quasi criminal in nature. What this means is that while the offense has many of the characteristics of a criminal case, it is not. Nonetheless, a conviction results in penalties (e.g. license suspension, fines, surcharges, jail, etc.) the severity of which largely hinge on whether it is your first offense, second offense or third offense. Your license will be suspended for 3-12 months for a first offense, 2 years for a second offense and 10 years for a third offense. There is also a fine and an annual surcharge of $1,000-$1,500 per year for three years that must be paid to the Division of Motor Vehicles as a condition of restoration of your driving privileges. Jail is mandatory for repeat offenders with 2-90 days for a second and 180 days for a third offense. These penalties apply to both alcohol based 39:4-50 violations and those stemming from driving under the influence of marijuana, cocaine, pain pills and other drugs. The attorneys at The Law Offices of Jonathan F. Marshall have a passion and a commitment to fighting for the rights of those accused of drinking and driving offenses in Middletown. We know from experience that you can succeed despite the intolerance for DUI under New Jersey law. Our team of highly trained and skilled lawyers have a record of favorable outcomes that spans more than a century. If you are interested in a real opportunity to avert a conviction for DWI, call 732-615-0039 for assistance. An attorney will conduct a comprehensive review of the facts surrounding your charge and formulate a strategy that insures you have the very best chance of a guilty finding.